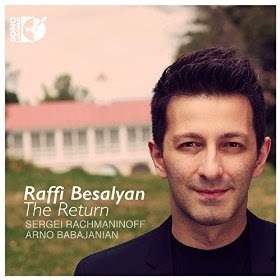 The music of Rachmaninov is clearly dear to Armenian pianist Raffi Besalyan’s heart. This is his second album, after the 2012 Dance, Drama, Decadence, and while both programmes are mixed, both are dominated by Rachmaninov. This time round we hear a selection of preludes (from opp. 3, 23 and 32), Etudes-Tableaux and the Correlli Variations. They are popular works all, and well represented on disc, but Besalyan more than justifies his survey with playing that is passionate and involving – plenty of drama and plenty of poetry – but which is also precise, disciplined and intelligently paced throughout. The programme begins with a lollipop, the C Sharp Minor Prelude, op. 3/2. But from the very opening phrase it is clear that Besalyan intends to keep us on our toes. The pause after the first three chords is teasingly held far longer than the opening tempo suggests. Then the quieter textures enter, and the music gradually gets back up to pace. The structuring here is excellent, with the tempo and density of texture gradually increasing up to the climax. Within this, individual phases are shaped, but with infinite subtlety, so as not to disturb the flow. To continue, the G-Minor Prelude, op. 23/5, another favourite, and a chance for Besalyan to demonstrate a more strident approach. Louder dynamics never compromise Besalyan’s clarity of tone or precision of articulation, which gives these passages all the more impact. The quiet music, too, benefits from that impeccable control. A real highlight of this disc is the B-Minor Prelude, op. 32/10 “The Return”, from which the album takes its title. The prelude was inspired by a painting by Böcklin, and the entire album takesthis as a theme. It shines through this performance, and through Besalyan’s ability to express Rachmaninov’s bittersweet nostalgia without ever wallowing in sentimentality. The Etudes-Tableaux introduce more varied textures and moods. A highlight here is the Appasionato, op. 39/5, one of the more substantial and involving of Rachmaninov’s piano works, and an excellent showcase for Besalyan’s structural thinking: Despite the agitated and dramatic textures from the very start, he is able to shape and build the music, giving focus and direction to every phrase. So too with the Corelli Variations. The theme is presented here with the utmost simplicity, giving no hint of the complexity and turbulence to follow. As ever, discipline and clarity are as evident as emotional engagement in Besalyan’s playing, and the contrast between each of the variations, while unmistakable, is never exaggerated, the better to articulate the work’s overall structure. An unusual choice to conclude: four short works by the Armenian composer Arno Babajanian. We’re not far from Rachmaninov here, Babajanian drawing on the older composer’s work for textural and harmonic ideas. But the melodic material is Armenian, as lyrical as Rachmaninoff’s but less complex. There is less emotional sophistication here than in any of the Rachmaninoff, but that very directness itself is attractive. The best of the Babajanian works is the Vagharshapał and Dance, it has the most regional colour of the four and the expansive piano textures are engaging, especially when rendered with the clarity and evenness of touch Besalyan brings. Attractive packaging, with plenty of pictures of the pianist, although sadly no reproduction of the Böcklin painting from which the recording indirectly takes its name. The liner essay is informative, erudite and intelligent (full disclosure: it’s by me). Sound quality is good, the recording made at the Sono Luminus Studio with what sounds like an excellent Steinway D. A Blu-ray audio disc is supplied along with the standard CD, and chances are that sounds even better still. Recommended.